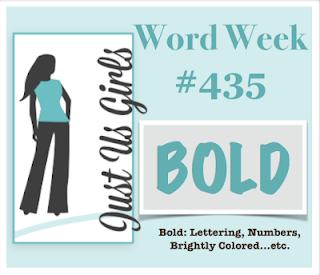 It's Word Week at Just Us Girls and our host Ina would like to see bold cards. I happened to have a smooshed DOX background on my desk that looked pretty bold to me so I added a flower and called it good. I've had the TH flowers for quite a while but I just got the dies which allowed me to put my daisy on the background. It was stamped with DI and then I used a waterbrush to move the color around. The sentiment is from PB. How do you interpret the word 'Bold'? For inspiration check out what the Design Team and our Guest Designer for the month of April, Karren Johnson, have made. The winning card maker will be chosen Chic of the Week and have a chance at guest designing in June. We'd love to see your card in the gallery. Yowza - this is drop dead gorgeous!!! I love the smooshing, I love the postage stamp frame, and I LOVE, LOVE, LOVE the daisy. Such a work of art here, well done! Wow, great background and the daisy is so perfect on it! Great card! That background is gorgeous and wonderfully bold behind that fabulous daisy! Superb card, Bobby! Beeeeeeeeeeeeeeeeautiful background Bobby. Love the colours and that flower is simply stunning. Nice choice of die too. *Good*? What? No way! Your card is absolutely gorgeous with the lovely background that serves as a perfect canvas for the pretty, stylish daisy! Love this!! Thank you soooo much for the sweet, glowing comment about my niece's card; she'll be over-the-moon thrilled when I call and share it with her! And yes, she's already surpassed me in several ways, including her comfort in using Zigs and Tombows! Wow! This is stunning and beautifully executed! Love it! What a terrific background for the big bloom! This is lovely Bobby! A beautiful background, Bobby! I have this set of flowers and dies and need to use them. Your watercoloring of the daisy is so pretty! A wonderful contrast to the bold background! Not sure which I love more...that FAB background or that realistic daisy! All in all, a fabulous card Bobby! Well done! Beautiful background and I absolutely love that big beautiful daisy! Such a beautiful effect you achieved with the Distress Inks.